Needless to say the Mother/Earthbound series is my favorite series in gaming. It has only had three official installments but all three were amazing, especially seeing as how Mother 3 managed to somehow exceed expectations despite how amazing Earthbound/Mother 2 was. As such it becomes one of the few JRPG series I can think of that lacks a “we don’t talk about that one” black sheep. Of course this is because Shigesato Itoi the series’ creator didn’t simply create the games for profit and it was clear that his artistic vision mattered to him more. As such you end up with a series that completely averts seasonal rot. Then there is the case of fan games. Most Mother fans probably know about the Mother 4 fan game that has been in development since around 2008 or 2009. It is a fan game that I have noticed a lot of people saying “I normally ignore fangames but this looks pretty good” in response to. I would attribute this to the fact that, from what I have read on the game’s development page, the developers are very serious about this and are focused on trying to make sure this game is its own thing rather than piggy backing off of the previous games. However, Mother 4 was not the first significant Mother fangame to be released. Mother: Cognitive Dissonance was originally released around 2009 (a rough estimate since I’m having trouble finding release details on this game) and having an updated rerelease in 2014 (if when the game’s trailer was uploaded is any indication). Cognitive Dissonance is relatively unknown compared to Mother 4 despite the fact that quite simply, Cognitive Dissonance is a very good game. Cognitive Dissonance was made by a fairly small group of people who, similarly to the main games and Mother 4, clearly put artistic vision before profit. Hell the creator even had a post on his Tumblr page where he addressed this. This definitely shows in the final product. While Cognitive Dissonance is not necessarily as flawless as Mother 2 and 3, that really does not matter much. The reason for this is because Cognitive Dissonance as a damned good game regardless and is almost as good as the main games. Unlike the main series which starred humans, Cognitive Dissonance takes a unique approach in that your party is made up of enemies from the previous games, and a Mr. Saturn. Our main character is Alinivar, a mook who is called to protect the apple of enlightenment from Giegue. He is joined by Colonel Saturn, a gun wielding Mr. Saturn, Larice, a defective Starman that rebels against Giegue, and Zarbol, a mini saucer piloted by a small insect. A small complaint that I have with the story is the fact that Zarbol’s introduction is really rushed and he is not given much of a backstory. This is further jarring considering that Zarbol plays into a rather big twist in the game. The game’s setting actually takes place in space and involves traveling other planets, giving it some similarities to the Phantasy Star series as well. You start out on Saturn, but you are also taken to the rest of the planets in the solar system throughout the game, although some just existing for sidequests. This gives it a unique tone compared to the main games, which all took place entirely on earth. Granted you do end up going to Earth eventually, but once you get there, it feels like you are actually visiting a strange new planet, as opposed to the familiar one we all know. Cognitive Dissonance also treads revolutionary progressive ground as the first Mother game with an all Jewish cast. What Cognitive Dissonance really excels at is how it manages to seamlessly combine its own compelling storyline with the lore of the Mother series. 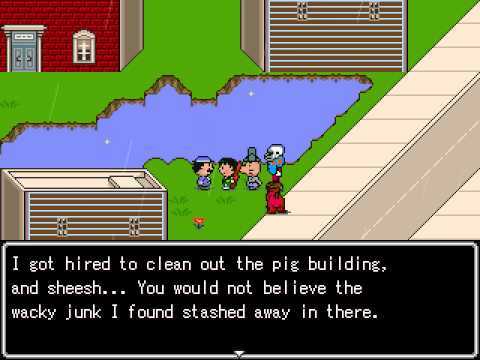 The game itself takes place after Giegue’s defeat in EarthBound Beginnings and about 10 years before the events of Earthbound, or at least before Ness is born. The game’s major focus is on Giegue’s backstory and how he ends up turning into the eldritch abomination known as Giygas. I’m not going to really spoil anything, but I will just say that this element is handled so spectacularly that I would think Itoi wrote it himself if I didn’t know any better. It fits in so perfectly considering how little focus Giegue had in the main series. Hell the game even manages to have some connections to Mother 3 surprisingly enough. I should note that by the end of all three of the main games, I felt completely attached to the world they had formed and it was hard to let go of them. The same thing happened with Cognitive Dissonance to the point where I still have not played another game for almost two weeks (except for playing a little bit of LISA: the Painful). This can do with a lot of things, but something that likely contributed was just how strong the game’s final stretch was. Share if you agree that Mr. Saturn lives matter! Chapter 7 and 8, not even counting all of the sidequests that become available, is absolutely intense plot wise. I don’t really want to give any specific details due to spoilers but it is just superb. It is to the point where I would say that the Giygas battle in Cognitive Dissonance was better than the one in EarthBound, which is saying quite a lot seeing as how well known the Giygas battle in Earthbound is. However, what also factors into this is that there are multiple endings to Cognitive Dissonance that you get based on completing certain sidequests and how you go about fighting Giygas. As a result of these endings, you can end up with alternate boss battles or even a hidden ninth chapter. The graphics in Cognitive Dissonance, predictably, use a similar art style to EarthBound and Mother 3. The graphics are serviceable in an artistic sense but nothing impressive, which is to be expected considering that this is a free to play fan game. There is no voice acting either, which once again is to be expected considering the series source material. Most of the sound effects are lifted straight from EarthBound which works well enough. The game’s original effects also work quite well. The music consists of either reused or remixed tracks from the main series, or original compositions. One complaint I have is that it sounds jarring when you shift between songs made to fit SNES sound chip limitations to songs with much higher quality instrumentation. The decision is even more questionable considering that most of the songs used from Mother 3 actually were rearranged, albeit with questionable quality. That is not to say that the songs on their own are bad perse, but there are some that just sound really off. Specifically, the game’s versions of “Unfounded Revenge” and “Rock n Roll” come to mind. Furthermore, I don’t even feel that the Mother 3 battle themes and area themes even fit with the world and storyline of Cognitive Dissonance. It makes sense to feature tracks from the first two games considering that Cognitive Dissonance is made to connect the two games together. The tracks from Mother 3 were intended to fit a completely different type of game, and as such come across as jarring when put along with songs made to be far more similar to the first two games. That is not to say that the Mother 3 songs didn’t fit at all, as the unused theme of love was finally put to use in great effect, it is just that the game could have toned them down a bit. However, I will make it known that the songs from the first two games DO fit very well. The gameplay of Cognitive Dissonance takes a departure from the main series in that, instead of a traditional turn based battle system, it uses an active time battle system reminiscent of the one used in Final Fantasy 4-9 and Chrono Trigger. The reason for this is most likely due to it being the default battle system of the version of RPG Maker that this game was created in. The way the active time battle system works is that each character has an ATB gauge, and when it is full, said character gets their turn. The rate that the gauge charges up is affected by the character’s speed stat, and will fill up faster if their stat is higher. If I’m being honest, I was never the biggest fan of this battle system even in the older Final Fantasy games. Granted I don’t necessarily hate the system more so than I find it rather chaotic and alienating when I can’t take my time to plan out my moves because enemies will just take pot shots at me the whole time. I will at least give the game credit in that it keeps enemies from attacking you when you are scrolling through the items menu. To further rub salt in the wound, the game does not even retain the scrolling HP meter mechanic from Mother 2 and 3, despite the fact that the active time system would have worked perfectly with it and added a lot more strategy to battles by trying to get off a healing spell in time before the meter reaches zero. Further issues with the game’s battle mechanics include the fact that a majority of buffs, debuffs, and crowd control abilities can only be obtained through easily missable sidequests, which means that battles become overly simplistic bouts of “attack and heal.” Granted this could be circumvented by not missing said sidequests, but withholding key gameplay elements from the player intentionally is a terrible idea. I do not see what the problem was with just having your characters learn spells by gaining levels like most jrpgs, including the main series. Despite this, the game is mostly easy enough as it is anyway. My experience with the main game was basically getting through most of the game through the brute force method (just attacking with your strongest ability and healing with no set strategy in mind) until close to the end of the game where I can’t continue due to being underleveled, grinding for about half an hour, then brute forcing my way through the rest of the game. Granted, I will say that I did skip out on a lot of the sidequests that become available during chapter 7. Similarly to games like Final Fantasy VI and Chrono Trigger, Cognitive Dissonance decides that the best time for sidequests to become available is right before the final battle. I will give the game credit in that a lot of these sidequests are very interesting and do add depth to the main storyline (which I have figured out by looking up videos of them after I already beat the game). In fact, I do hope to 100% this game in a future playthrough. In terms of the game’s layout, the dungeons do have nice aesthetics and are nicely varied. The game also improves upon Mother 2 in that enemies travel in a set pattern on the overworld instead of simply bum rushing the player on site. As a result, the game is free from annoying random encounters, with exception to towards the end where the game decides to throw in a nod to Mother 1 by bringing back random encounters at the same insanely high rate while also requiring the player to wander the area to find a girl who keeps appearing and disappearing. The downside to the way the enemies are laid out is that they no longer run away from you on the overworld if you are stronger than them or if you beat the boss. This also removes the abilities to get back attacks and increase the rate of instant kills. However, the game deserves props simply for keeping the mechanic of “instantly killing an enemy significantly weaker than you when encountering them on the overworld while still gaining the experience and item drops.” The reason I say this is because they omitted this feature in Mother 3 for some god forsaken reason and instead just opted to allow you to instantly kill weak enemies by dashing through them but not giving you any experience. Also there is the fact that, even 20 years after EarthBound’s release, a feature that should be an RPG standard is still barely used. One last complaint with the gameplay is how space travel is handled. You basically need to fly from one planet to another using your space ship and are given limited fuel to do so. Traveling through space is like using an overworld map in other jrpgs with the exception that 95% of the map is a back void and it is nigh impossible to find your way to another planet without getting lost. If you run out of gas, you will get towed back to Uranus, which is a decent touch seeing as how it helps the player find their way. However, this becomes s problem in that keeping a full tank of gas is very expensive due to the fact that money in this game is not nearly as plentiful as in the main games, meaning that you could end up being stuck at multiple points where you are wandering space to find your next destination only to inevitably waste up all your gas, and thus waste money to buy more gas and waste that gas in a vicious cycle. Thankfully there are sidequests that give you access to infinite fuel and to a radar that shows you where you are on the map (beforehand you have a map, but nothing to tell you your current position), but as said before these things should have been included from the start; and simply getting said upgrades could end up being a hassle unless you have prior knowledge of what you are doing (which was kind of tough to get seeing as how it was hard to find a full walkthrough on this game so I only managed to figure these things out through picking up bits and pieces online). All in all though, I will say that the base gameplay is at least serviceable and a lot of the flaws in direction are only an issue on the first playthrough. Is Cognitive Dissonance as good as EarthBound and Mother 3? The answer is, no it is not. However, if Cognitive Dissonance was an officially released game in the Mother series that was made by Nintendo and had Shigesato Itoi’s involvement, I would not be disappointed. This game perfectly captures the charm and feel of the Mother series and, despite me making a big fuss about the battle system, I’m pretty sure most people will not have issues with it given how well liked the classic Final Fantasies are. If it were not for the fact that there was a lot of reliance on inside jokes within the Mother fandom, I may even have been able to suggest this as a stand alone game. The spectacular job on this game has me even more confident that the Mother 4 fangame will turn out well given that the Mother fandom has proved it is capable of greatness. Overall, I highly suggest that any fans of the Mother series check out this game and I am very glad I had the chance to play it. This review was originally posted as a DeviantArt journal entry on September 4th of 2016 and has since been re-edit with enhanced presentation.